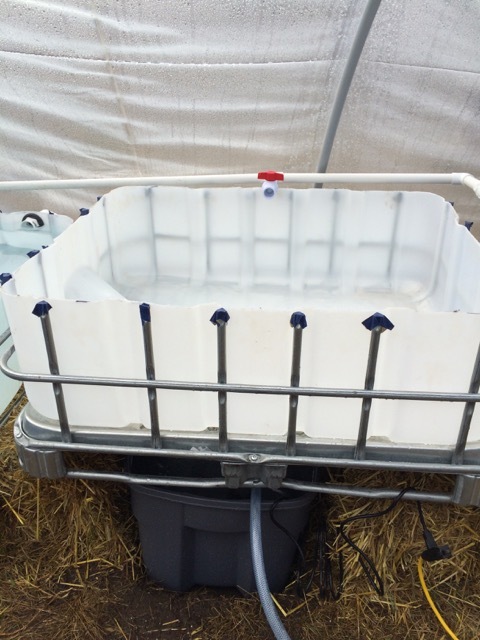 Find some IBC Totes, food grade to create inexpensive fish tank and grow beds. We found two for $100 each. Cut the top off one to create a large fishtank. Cut the top and buttom parts off at about 12-14 inches as the grow beds. 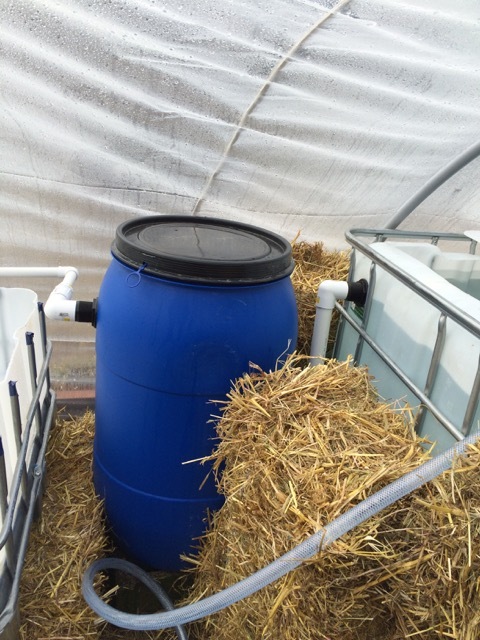 Find a blue food grade plastic barrel as a filter tank. Get PVC pipe from hardware stores like Home Hardware. 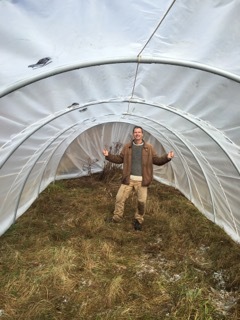 For the greenhouse we used the poly tunnel design with PVC pipes, 2 each for a 20 foot span and about 12 feet across on the ground. Put 3 foot rebar in the ground on each side to hold the PVC pipe and join them in the middle at the peak of the poly tunnel greenhouse. Order some poly designed for greenhouses, 20' x 50'. 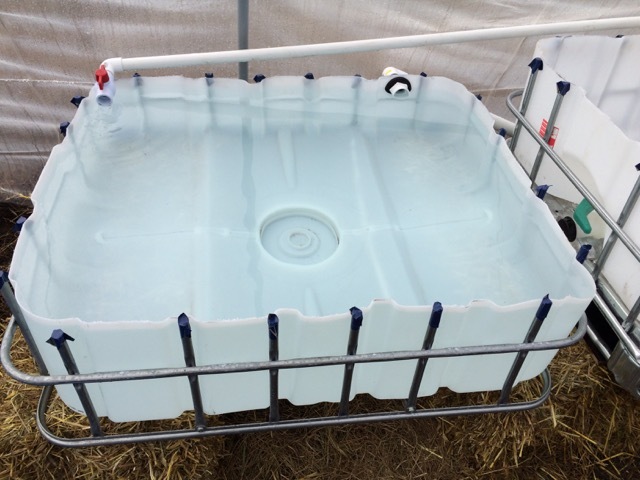 We used a 60 watt water pump. You can see it under the middle tank, in the sump tank. It pumps the water bank up to the fish tank. The last tank in the row is the floating raft tank. Greenhouse polytunnel with system showing through. 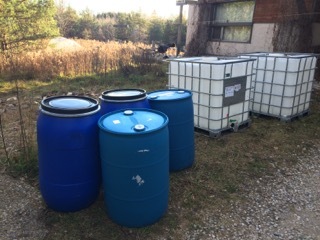 From left to right we have the fish tank, then filter blue barrel, then hydrotin ebb-n-flow grow bed, and then last the floating raft grow bed. After that is a compost pile inside a hole and inside a stack of straw bales. This is designed to provide heat to the system. 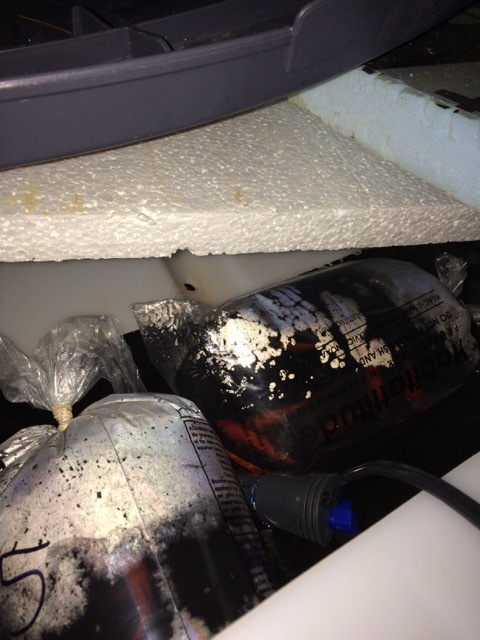 In the fish tank are also 2 x 300 watt water heaters. 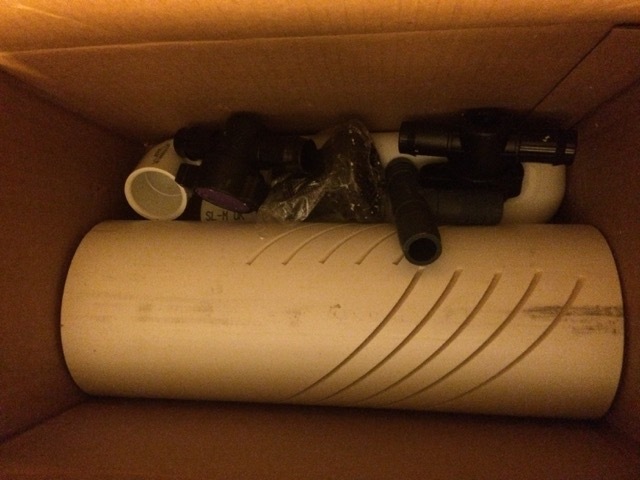 This is a bell siphon kit we got online from the Colorado online aquaponics website. 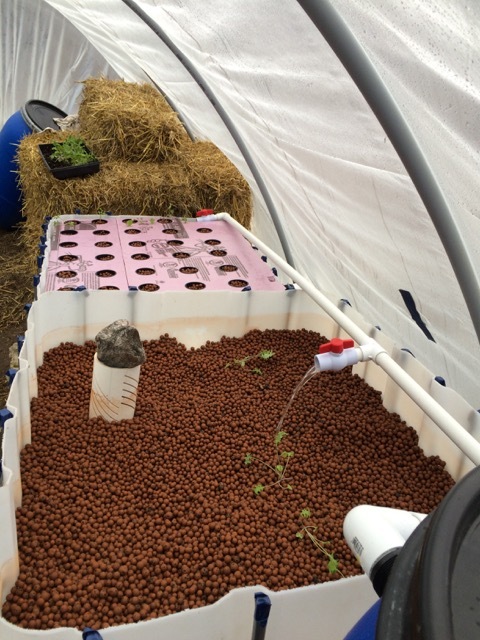 Hydrontin grow bed with bell siphon installed. We added a rock to keep it from floating up. 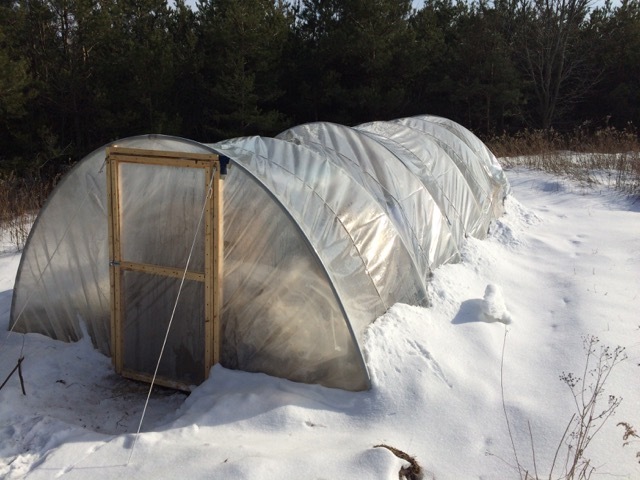 Frozen grow beds...-28C over night. 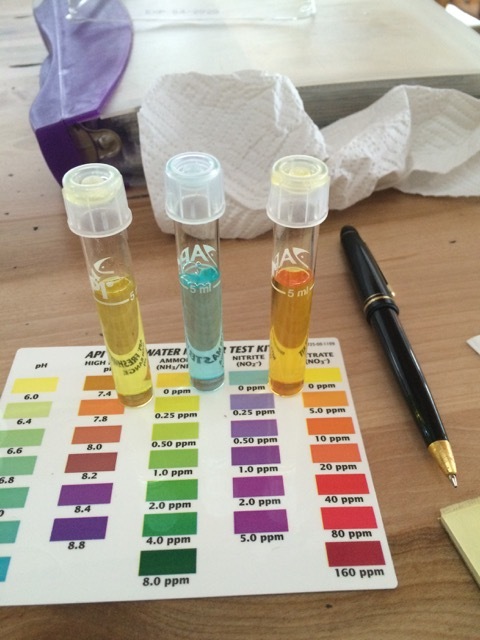 Water test kit for checking nitrate levels as well as Ph. 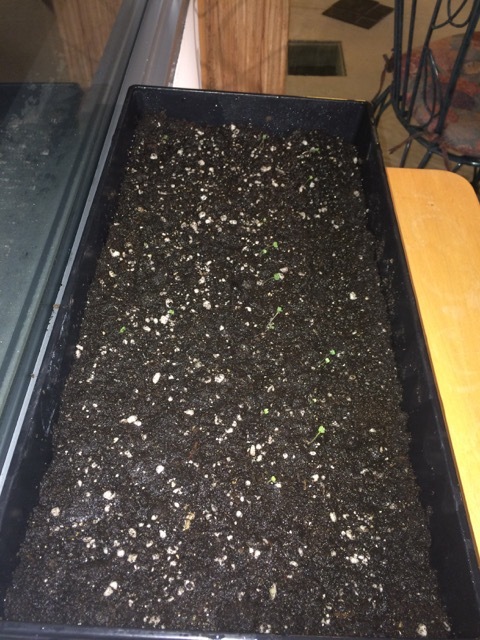 Started some Kale and Arugala seeds indoors. 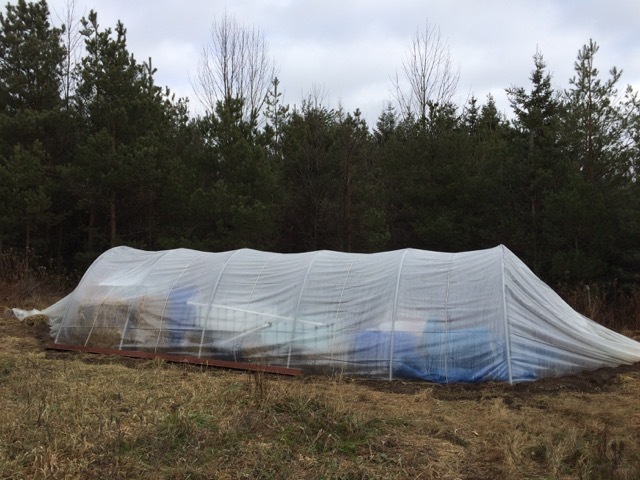 Greenhouse holds up under snow loads. Sunny days get the snow to slide off the top. I help it a bit. 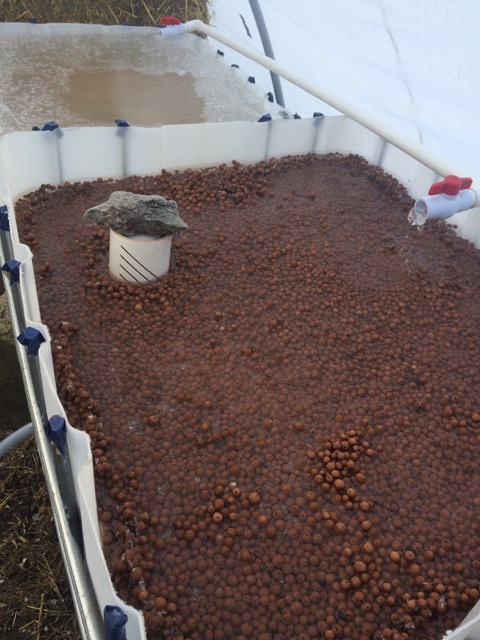 Started some Arugala in the ebb-n-flow bed and there at the far end the first hole cut in the floating raft system for a plant. 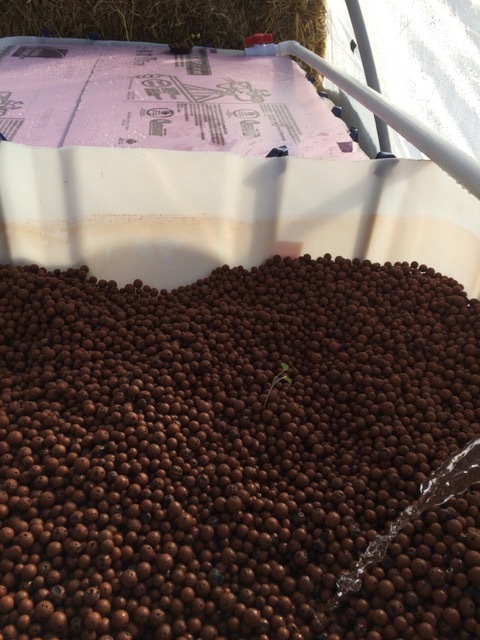 Arugala and Kale started in the grow bed. Note rock on bell siphon to keep it from floating up. 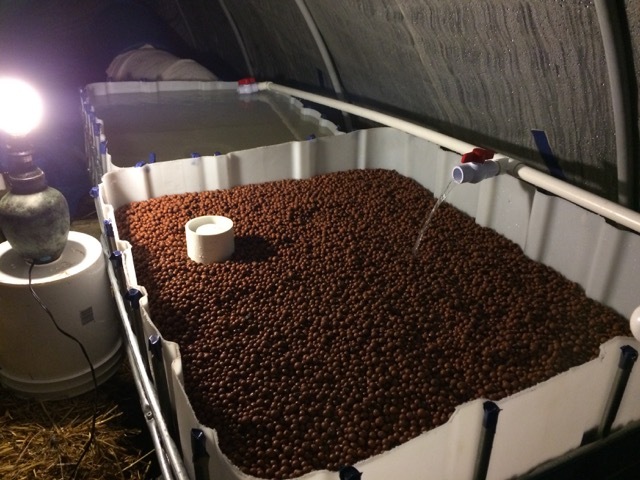 Next is the floating raft grow bed with all the holes cut for 3" cups that hold a little hydrotin medium. 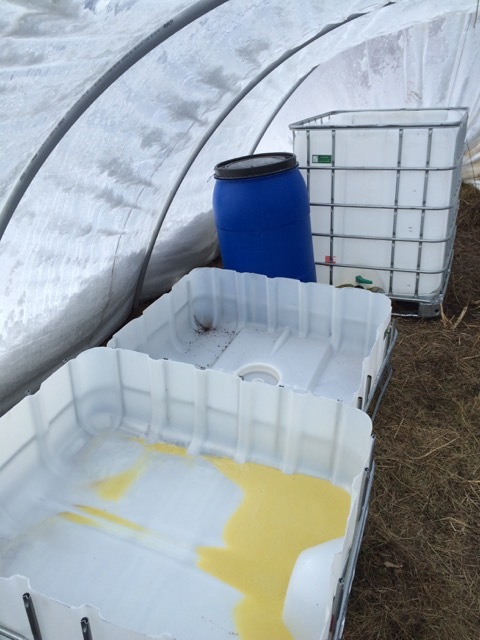 After that is the compost pile designed to give off heat in the greenhouse to keep things from freezing overnight.